Down by two goals with under five minute remaining in the third period, Minnetonka needed someone -- anyone -- to step up and play the hero. 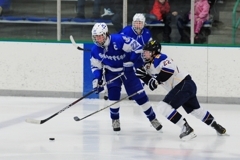 The Skippers’ senior forward scored with 4 minutes, 42 seconds remaining in the third period and capped off the comeback by scoring the game-winning goal in overtime, giving Minnetonka a 4-3 victory over Wayzata on Saturday, Feb. 11. While Baskin’s two goals stunned the Trojans’ home crowd at Plymouth Ice Center, Minnetonka coach Brian Urick wasn’t surprised. Looking outside the score sheet, Baskin credited the win to both the work effort and attitude of his teammates. “Going into the third we tried to keep an upbeat attitude,” Baskin said. “We stayed together as a team. We've had some games this year where we've started pointing fingers a little bit for why we're down and fell apart. But we stayed together as a team and once we popped a couple we really got it going. Despite the Baskin’s heroics and his team’s late rally, Urick didn’t hesitate pointing out Minnetonka’s slow start. One thing that worked to the Skippers’ advantage was the experience of their eight seniors including Baskin. With the victory, Minnetonka improved its record to 20-3-0 and also tied Edina for a share of the Lake Conference lead. Along with the Lake Conference title being up for grabs, the Skippers' win over Wayzata also helped their playoff positioning. “It was definitely a big one,” Baskin said. “We needed it for sections too. We lose this game, sections is just a mess. We need to get that number one seed -- we still have another big one on Thursday (Feb. 16, against Eden Prairie). But we love winning the conference. We haven't done since a couple years ago and it's definitely a point of pride for us. To beat all these great teams, it's always a battle. “No one is ever going to go undefeated." Closing in on the final minutes of the third period, it was clear Wayzata was tired. After all, the Trojans had held No. 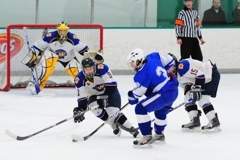 2-ranked Minnetonka to one goal in over 40 minutes of the Saturday, Feb. 11, Lake Conference battle. That’s when perhaps the most dangerous weapon the Skippers have came into play -- depth. 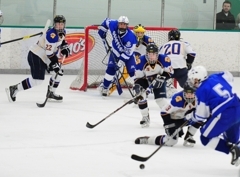 “It's really a great thing that we can have three lines,” Minnetonka coach Brian Urick said. “These teams that shorten the bench -- you get tired. And when the situations get more tense you get tired, just mentality drained. 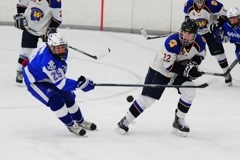 Minnetonka senior forward Erik Baskin also noted his team’s depth as an advantage. The Skippers pack a devastating one-two punch starting with the forwards line of Connor Thie, Sam Rothstein and Baskin followed by the line of Vinni Lettieri, Max Coatta and Jack Ramsey. Minnetonka’s third line forwards Justin Bader, Phil Katopodis and Jared Ridge kept up pressure when the Skippers top two lines needed a breather. “We definitely had everyone going tonight,” Baskin said. “We had a defenseman, Jack Teal, jump up (to play forward). We had a fourth line forward jump up and play a couple shifts. They did their part. Everyone pretty much chipped in. Third line played a great game tonight. They didn't score but they're all over the place, creating chances wearing down those (Wayzata defensemen). It creates chance for other guys when they get out there. With No. 2-ranked Minnetonka needing a late rally to defeat No. 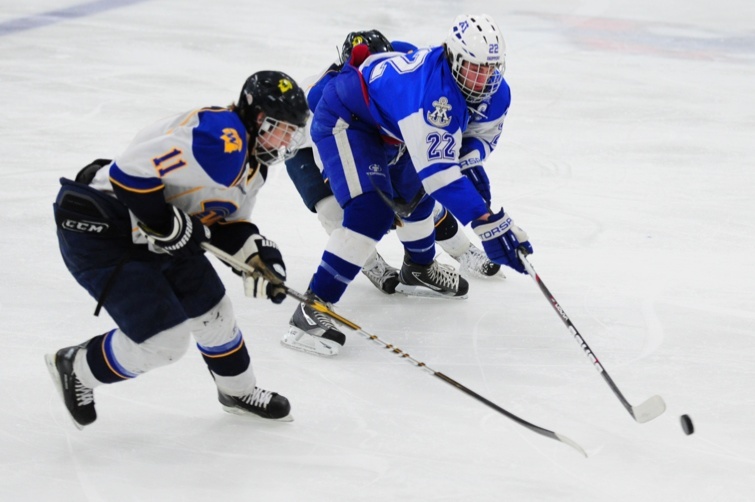 9 Wayzata, the toughness of the Lake Conference seems to be both apparent and perennial. In the Saturday, Feb. 11, game, the Trojans displayed their own toughness and frustrated the high-scoring Skippers. “They blocked a lot of shots,” Minnetonka coach Brian Urick said. “You're not going to score eight or nine against Wayzata very often. I think they might have blocked 20 shots tonight. Minnetonka senior forward Erik Baskin also noted the difficulty to get shots on goal and came up with the same number as his coach. 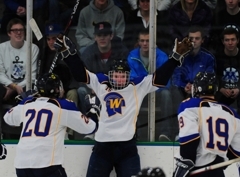 Throughout the game, the Trojans noticeably sacrificed the body and their bench erupted each time a shot ricocheted off a white Wayzata home jersey. having too many men on the ensuing line change. 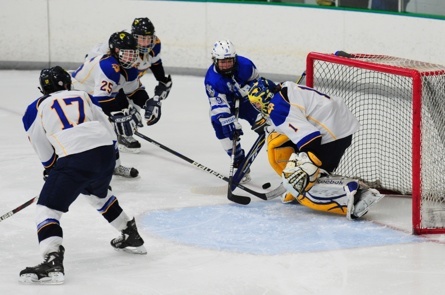 Wayzata’s constant blocking of shots made things difficult for the Minnetonka players as well as its bench. 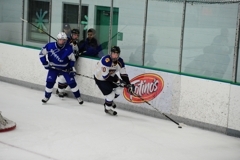 After the overtime loss to Minnetonka on Saturday, Feb. 11, Wayzata coach Pat O’Leary took some time to speak with the MN Hockey Hub about the game and the remainder of the season. Question: No one ever wants to lose a game but perhaps the silver lining is that it was an overtime loss to the No. 2-ranked team in the state. How do you think your team performed? Answer: I thought we probably played the best three periods of the year. We played pretty well against (Eden Prairie) a couple weeks ago but I think top to bottom through our lineup we played great holding those guys to 13 or 14 shots in the first two periods. The bottom line is our goaltender has got to make one or two of those saves at the end -- that's the reality. It's the harsh reality, but it's just the reality. Obviously it's one of those deals where (Minnetonka has) a lot of top-end talent, especially scorers. I think we did a good job holding them at bay for a majority of the game. I thought we played great for a majority of the game. 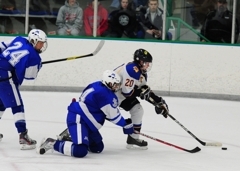 Q: One thing Minnetonka noted and I saw was the constant blocking of shots and the tenacious forecheck by your team. Was that the game plan for this one? A: Biggest thing that we work on -- and you gotta give credit to our boys -- we feel we do a good job of playing real good defense in our zone. We do a pretty good job of playing neutral zone defense and as you saw tonight we do block quite a few shots. That's something we work on a lot and that's kind of the mentality that we have. We're proud of our guys and the way they competed and blocked shots and kept them to the outside and cleared pucks out from the front of our goalie. Like I said, I think we played well for the majority of the game and I'm assuming we made them tired towards the end of the game and that's a good compliment for our guys. I think that means we played pretty well. Q: With the hard fought effort by your team, where Wayzata go from here? A: It's a tough week for us scheduling-wise and that's just how it works. With the whole (Jack) Jablonski thing and we had to reschedule the game (against Benilde-St. Margaret's) which was definitely the right decision. But with our conference and how the schedule falls, you play three top eight teams back-to-back-to-back. We didn't get a 'W' in any of them and that's not the best thing but going forward we've got four days before our next game -- obviously we've got to play Edina again, another good team -- but we understand that. I think the biggest thing is we just need to learn some things from how we played tonight as a team and then going off a couple good practices this week and try to get a win on Thursday and maybe on Saturday, just put a couple nice games together. If we can play like that in the playoffs, I think we'll be pretty happy. 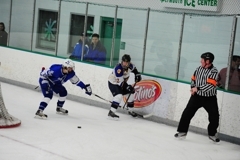 Erik Baskin scored with 4 minutes, 27 seconds remaining in overtime capping off a comeback victory for Minnetonka as the Skippers scored three unanswered goals to defeat Wayzata, 4-3, on Saturday, Feb. 11. The game-winning goal was Baskin's second of the afternoon as the senior forward scored late in the third period to kick off the Skippers rally. Wayzata held a 3-1 lead over Minnetonka heading into the third period, as the Trojans received scoring from Kenzie Vold, Kage TIller and Sam Majka. 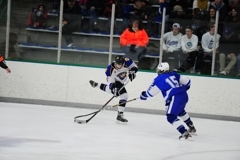 Vold scored 30 seconds into the first period giving Wayzata an early spark. Minnetonka's Vinni Lettieri scored an unassisted power-play goal in the first period. The Skippers' depth began to show in the third period as Baskin scored his first of the game at the with 4 minutes, 42 seconds remaining in regulation. 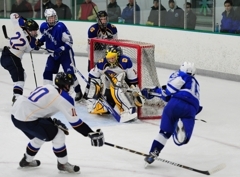 Tommy Vannelli scored for Minnetonka two minutes, 14 seconds later to tie the game after a series of blocked shots by Wayzata. Minnetonka outshot Wayzata 14-4 in the third period and overtime to finish with a 27-22 advantage in shots on goal. 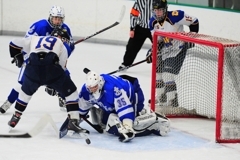 Wayzata senior goaltender Alec Almquist made 23 saves in the loss. 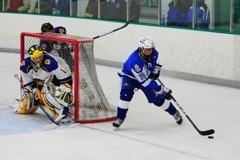 Paul Ciaccio finished with 19 saves for Minnetonka to collect his eleventh win of the seaon. The battle for the coveted Lake Conference title will continue on Thursday, Feb. 16, as both teams will host ranked competition. Looking to bounce back, No. 9 Wayzata (13-9-1) will take on No. 5 Edina at Plymouth Ice Center at 7 p.m.
No. 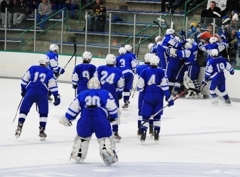 2-ranked Minnetonka (20-3-0) will host No. 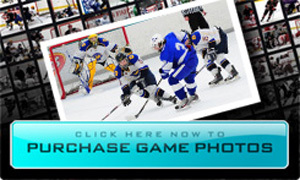 6 Eden Prairie at Pagel Activity Center in a game with both conference and section implications at 7 p.m. The senior forward started the Skippers' comeback victory in the third period with a momentum-changing goal and finished the rally with the game-winner in overtime. Solid effort throughout the game as Baskin anchored the Skippers' starting line with Connor Thie and Sam Rothstein. With a different result, Majka's performance would earn him the game's top star as the senior forward had two points (one goal, one assist) and had six shots on goal. It was easy to see that Majka was exhausted late in the game but purely out of his constant effort and not for a lack of conditioning. 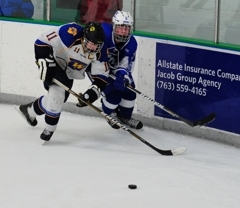 It was clear that Wayzata had a game plan in place for Minnetonka's high-scoring forward as Lettieri drew heavy attention from the Trojans' defense whenever he touched the ice. That didn't stop the junior from making an impact as Lettieri scored a power play goal and was a steady offensive threat.